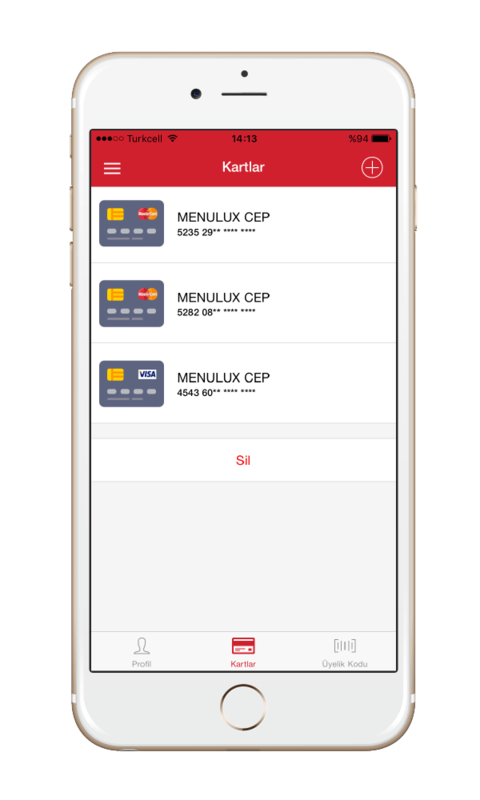 Menulux Pocket is a mobile payment app that enables you to take payments from your iPhone, iPad and Android phones. Download now from the App Store and Google Play store..
You can receive mobile payments via your customers' smartphones, create campaigns and increase sales with mobile coupons thanks to Menulux mobile POS system. Menulux Pocket is suitable for restaurants, cafes, bakeries, coffee shops and every business up to the hotel. Easily enhance your mobile payment experience with Menulux Pocket. Get mobile payments from smartphones integrated into the Menulux POS system, save your time! Take orders from table with Menulux Pocket! Menulux offers social digital services that allow your customers to send and pay orders via their smartphones. 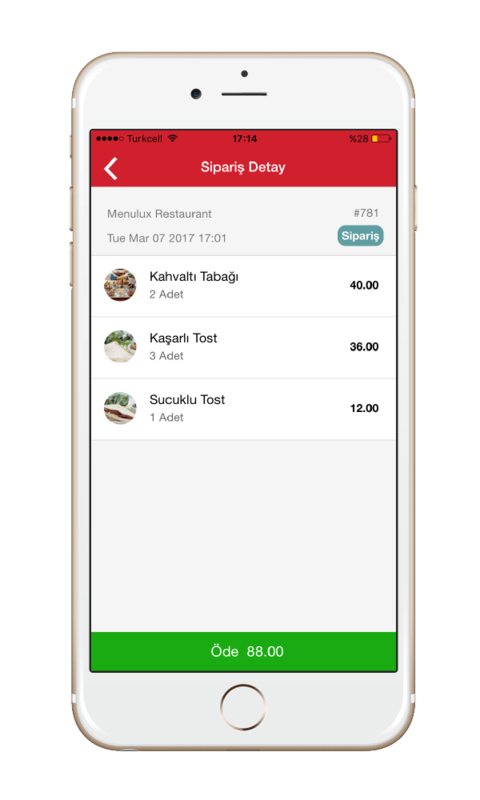 Thanks to Menulux Pocket app, you can start taking mobile phone orders integrated into your customers' smartphones. 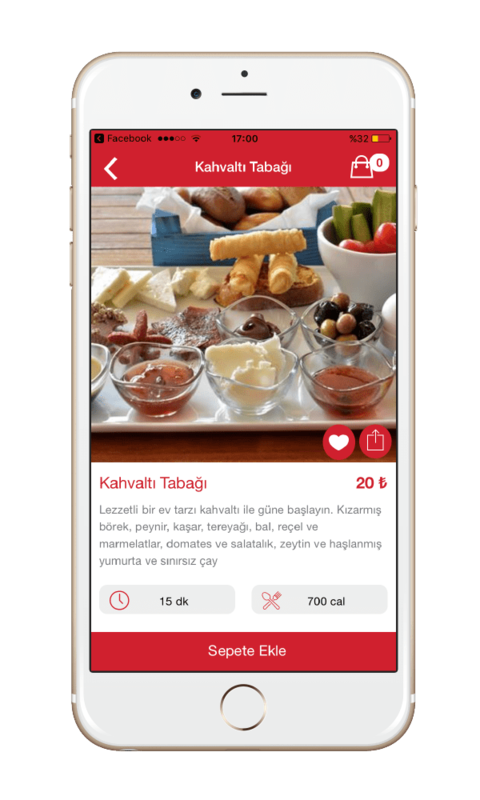 Without waiting for a waiter in the restaurant, simply browse through the digital menu on your smartphone and order the products you like with one touch. The Menulux POS System offers advanced features that enable you to identify your customers' location using iBeacon technology and determine your table location. View your order, pay for it on your mobile! Customers can check preparation status of their order. They may make the payment after their order is approved and processed by the restaurant. Customer can verify that the order s/he sent is correctly received and approved by the restaurant. S/he can check the details of confirmed order and check the order amount. After checking order amount, payment can be easily made by touching the PAY button on the order details section. 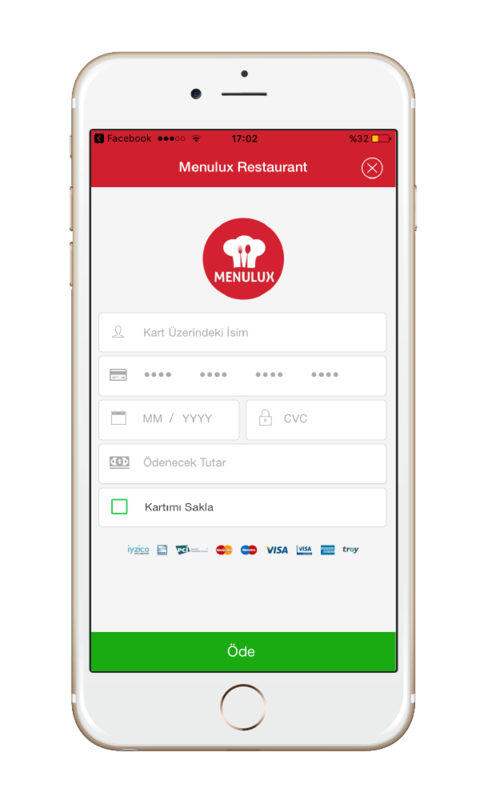 Menulux Pocket app offers mobile payment from smart phones integrated into Menulux system with online POS infrastructure. Menulux Pocket allows your customers to make mobile payments quickly, easily and reliably by entering credit card information on their iPhone and Android-powered smartphones. Menulux uses the iyzico infrastructure, which guarantees maximum level of safety with a 150 fraud control filter. With Menulux Pocket application you will have Iyzico's PCI-DSS certification and fraud control filters. Measures against fraud for both you and your customers are possible with fraud control. Check your credit card information on the payment screen to make mobile payments without having to re-enter your credit card information for your next orders. Your credit card information is stored with the PCI DSS assurance on iyzico secure payment provider. Save your cards, make a one-touch payment! The Menulux card saving service keeps the credit card information of your mobile paying customers with PCI DSS assurance, allowing them to quickly pay for their subsequent orders without entering credit card information. By entering your card details in the Menulux Pocket application you can securely save your credit cards and use them for your next mobile payment transactions. Make one-touch payment of your orders using your registered credit cards. You can make payments quickly and easily by selecting the card you want to pay from your registered cards on your order payouts. Start trying the Menulux Pocket mobile payment app from the iPhone App Store and Google Play Store store. We have discovered an innovative way to visually present our menus, receive mobile orders and feedbacks with Menulux Pocket digital menu and mobile ordering system. Thanks to the Menulux POS system and digital menu software that we have been using for many years, we are able to take our orders much easier and faster, and we do all our work safely. We appreciate for the endless support Menulux has provided us from the first day we started working with their restaurant POS software and digital menu system. We chose Menulux digital menus to promote our products in the best possible way. We thank Menulux for its products that contribute to our brand value, and we recommend it to all other businesses. We're happy with Menulux. It's simple to use, inexpensive, and we love digital menu concept. We recommend Menulux to all innovative businesses that give importance to visual quality. Join the Menulux family and start taking advantage of our restaurant POS and tablet menu solutions.